The holiday season is a time of year where it can be easy to forget about best ecological and social practices. Tempted by sales and the Christmas rush, citizens turned consumer-crazy often overlook fairly traded alpaca wool hats for the latest advertised shiny made-in-China gizmo. This is why McGill’s chapter of Engineers Without Borders has been organizing the “Fair Trade and Locally Made” Christmas craft fair at the end of the fall semester on Macdonald Campus. 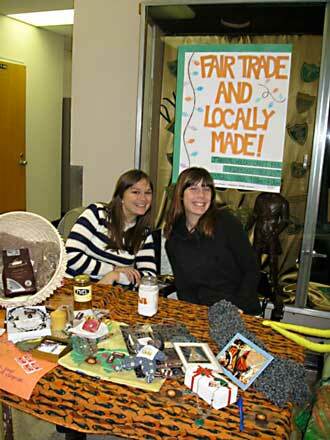 The fourth annual fair was held on Nov. 25 at the Centennial Centre. “We are trying to sensitize people to the issues of fair trade and how it applies to poverty,” said Carlo Primiani, a U2 Bioresource engineering student who was recently selected for a three-month Junior Fellowship placement in Africa with Engineers Without Borders, and one of the event organizers. “It’s fine to talk to people about fair trade issues, but here, we’re giving them an opportunity to act on it,” Primiani said. Back in 2007, this holiday event was organized to give early-bird shoppers the opportunity to buy high-quality, fair-trade goods from Dix Milles Villages, a fair-trade store in the West Island’s Pointe-Claire village. This event has now expanded to include student artisans, like “Weird Bug Lady” Bridgette Zacharczenko; the local Sainte-Anne’s Farmer’s market; Coop du Grand Orme; Punku Peru and many other local vendors selling hand-made jewelry and woven handicrafts. The event also serves as a community outreach opportunity for McGill. “We are hoping to diversify next year,” Primiani said, noting that some felt there were too many jewelry vendors at this year’s event. Nevertheless, the Fair’s principal goal to bring in a community of ethical businesses was achieved.